Located around the former Victoria Quay on Dundee's waterfront, City Quay is a retail, leisure and hotel development, which together represents a re-vitalisation of the area costing more than £20 million. Located on the north side of the dock and opened in 2002, the retail complex occupies listed former warehouses and extends out into the dock itself. The 155-bedroom City Quay Hotel lies to the west, next to the Dundee Customs House and Harbour Chambers and the former main entrance to the harbour. Housing development has taken place to the east, next to Camperdown Dock. The development includes a marina, together with the Frigate Unicorn, launched in 1824, and the former North Carr Lightship, both permanently berthed in Victoria Dock. 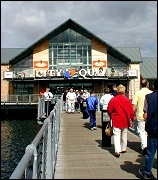 City Quay is owned by the Port of Dundee Ltd., a subsidiary of Fort Ports Ltd., who own and operate the harbour. City Quay, a £20 million-plus development comprising retail, housing and leisure facilities, has already begun to transform part of Dundee's waterfront. Set in a stunning location, City Quay promises families a unique blend of shopping and leisure just a few minutes walk from the city centre. Discovery Point is an award-winning visitor centre now home to the restored Royal Research Ship Discovery, the vessel used by Captain Robert Scott during his 1901 to 1904 Antarctic expedition. The Point is also the base of the British Antarctic Survey. It has a restaurant, shop and galleries. Verdant Works is a former jute mill which has been rescued and restored to tell the remarkable story of Dundee's long romance with the textile industries, Its collection of working machinery and innovative, hands-on interactive exhibits have secured a clutch of high-profile awards. The Old Steeple, Scotland's highest surviving medieval tower, is central to some of the most dramatic historical events in the city. Explore four floors of history and climb the 232 steps to the parapet for breathtaking views over the Tay estuary and the City of Discovery. Dundee Rep is a modern, recently refurbished, award-winning theatre which presents seasons with a broad range of content and themes. The Rep is also home to Scotland's only-full time acting ensemble and dance company, a popular venue for live jazz and blues and boasts a busy bar and restaurant. The McManus Galleries in the heart of the town offer one of Scotland's most impressive collections of Victorian art. The striking building - designed by Sir George Gilbert Scott - houses 10 separate galleries. Admission is free. Dundee Ice Arena, a £6.7 million development on the outskirts of the city, features an Olympic size ice rink, a café, bar, restaurant and skating supply shop. The rink has capacity seating for 2300 people and is a popular venue for ice hockey and curling teams, professional skaters and families alike. The Overgate, Europe's only single-sided shopping mall with a curved glass wall, has 42,000 sq ft of retail space and parking for over 1000 cars. Built at a cost of £250 million, it is home to almost 70 high street retailers and includes the second largest Debenhams in Scotland, the largest H&M in the country and the first Gap and GapKids in Tayside. Sensation is a visitor attraction based on the five senses and aims to make learning about science fun. Built at a cost of £6 million, Sensation houses more than 60 interactive exhibits based on sight, smell, hearing, taste and touch to captivate young and older minds alike. It has an internet room and a café. The Frigate Unicorn is the oldest British warship still afloat. Launched in Chatham in 1824, the 46-gun wooden warship offers a fascinating glimpse into the lives of sailors over 150 years ago. She now sits on anchor in Victoria Dock, a stone's throw from the city centre. The Mills Observatory on Dundee's Balgay Hill is Britain's only full-time public observatory. Constructed entirely for the city's inhabitants in 1935 and perched at a height of 480 feet above one of the city's most popular parks, the Mills has a powerful telescope, permanent exhibitions and a resident astronomer. Dundee's long association with whaling is chronicled in the 15th Century Broughty Castle Museum on Castle Green in Broughty Ferry. The museum also includes exhibits of local history, military history and seashore life. Dundee has a number of other castles which are well worth a visit. Dudhope Castle on Barrack Road is a spectacular white turreted castle with 13th Century origins. The building is presently home to the Business School of the University of Abertay Dundee. The 16th Century Claypotts Castle in Claypotts Road is a fine example of a complete Scots' tower house while Mains Castle in Caird Park - which also dates from the 16th Century - has recently been restored and is now home to a popular restaurant. Dundee hosts a number of arts and entertainment festivals throughout the year. These include the Dundee Jazz Festival, the Dundee Guitar Festival and the Dundee Flower and Food Festival. Full details are available from the Tourist Office in Castle Street. One of the city's proudest boasts is that it has 59 parks providing 4000 acres of parkland, more per head of population that anywhere else in the UK. Camperdown Country Park, the largest in Dundee, offers a variety of attractions. The neo-classical Camperdown House, built in 1828 for Admiral Duncan by a grateful nation in recognition of his victory at the battle of Camperdown, is set in 400 unspoilt acres of parkland. Within the grounds is the Camperdown Wildlife Centre which has over 80 species of animal including brown bears, wolves and wildcats. Other parks and gardens worth a visit are Clatto Country Park, Templeton Woods and Victoria Park which offer a variety of ranger led activities, walks and leisure facilities. Dundee has more than 100 of Scotland's finest golf courses on its doorstep. Within the city are Downfield Golf Club - a qualifying course for the Open Championship - Camperdown Golf Course and Caird Park Golf Course, all of whom welcome visitors. The city is a 20 minute drive from St Andrews - the 'home of golf' and the famous Championship links course at Carnoustie, which hosted the 1999 Championship. The River Tay is Scotland's longest river, beginning life high in the Highlands before spilling into North Sea at Dundee. The Tay and its estuary are a popular playground for watersports enthusiasts, yachtsmen, anglers and birdwatchers. The Tay is famed as one of the world's finest salmon rivers and holds the record for the biggest fish caught in British waters - a 64 pounder landed by Edith Ballantine in 1922. The city skyline is dominated by Dundee Law, an extinct volcano which rises to 571 feet. The summit can be accessed by car or on foot and offers excellent views of the surrounding countryside. Orientation boards provide a wealth of information and tell the history of the Law, from its earliest Iron Age occupation to the present day. Football is almost a religion in the City of Discovery. The two senior clubs - Dundee Football Club and Dundee United Football Club - live cheek by jowl with each other in Tannadice Street and both attract a fanatical following. Stadium tours are available on request. Dundee offers a huge and lively choice of public houses, bars and nightclubs. There are over 100 popular venues within easy reach of the heart of town. Establishments close to the University of Dundee and along the Perth Road are favoured by students. Many offer a high-standard of pub-grub and live music. Most of the city centre and west end bars get very busy at weekends, so you may have to hunt about to find somewhere for a quiet drink. The city is well served by a cosmopolitan selection of restaurants - Greek, Mexican, Italian, Turkish, Chinese, Indian and French cuisine are all on offer in the city centre. For local delicacies, try any of the chip shops which are dotted across the city. The Pie (pronounced 'peh') Supper has been a Dundonian favourite for years. Bad for the heart but good for the soul.